The experiment is complete--I Write: Being & Writing available through Amazon/Create Space rather than Lightning Source--and I am satisfied. You might wonder at the word satisfied. Why not thrilled or ecstatic? My experiment was to use CreateSpace's templates, to publish using a Word template for the interior block and the CreateSpace template software for the cover. Within the limitations imposed by using the templates, I am completely satisfied with my book--but there also is the inescapable truth that those limitations exist. I wanted to use the simplest approach so that when I used the process with my students, putting together the book was as straightforward, easy, and quick as possible. I feel that the CreateSpace process fills that need. I published I Write: Being & Writing to become familiar with the software and whatever quirks existed in the process. That really took little time, having already published three books through Lightning Source. You might imagine going to school at a large university and then transferring to a community college; the processes would be essentially the same to enroll and register for classes. It was like that for going from Lightning Source to CreateSpace. Instead of InDesign, I used Word. Instead of PhotoShop, I used CreateSpace's Cover Creator software. The results were predictable, and the limitations were what one would predict. Some lines in the interior have more space than I would like, due to Word's lack of tracking sophistication that InDesign has. I have to alter some of CreateSpace's Word template's styles to achieve a less intrusive look, such as centered, two-line titles (chapter number and title), rather than all caps left-hand titles that started with a chapter numeral. Word software is always a mystery and is less predictable than InDesign, although InDesign is much more complex. It took a while to understand the logic of whomever set up the template. This is nobody's fault, but it did take time. CreateSpace does explain in its instructions that the Word templates for the interior can be altered. The company also provides opportunities to choose from a variety of cover templates, and then those templates have some capacity for alteration, such as uploading your own cover image. The cover may end up with a flavor of boilerplate familiarity, but for my non-fiction book, the blocked visual layout was okay with me. Online software at CreateSpace also allows one to see how the interior and cover will look. This is a great feature to provide continual assessment of the book as you go. If something is below standard, such as a photo lacking resolution, then the software informs you. Once you are ready to publish, the software automatically will generate the PDF for the interior and for the cover. This is a great feature. It should be mentioned here for those who are more advanced with publishing software that one can use more sophisticated software such as Adobe products, create the bookblock and cover, convert to PDF, and then submit those, just like at Lightning Source. The big question is whether my next book will be a Print on Demand book through Lightning Source or through CreateSpace. This seems to be a hot topic on the internet. One good article (pro-CS) is "Why is Cool Gus Publishing switching from Lightning Source to CreateSpace?" I cannot argue with any of the ideas presented--lower price, helpful aids to evaluate the evolving cover and interior block, quite a lot of online advice, to mention a few. However, at this time I like it that Lightning Source works with me as a publisher, Wise Moon Books, and not as an author who wants to independently publish. It's kind of like dealing with the Apple company. The services are great yet are also completely controlled by the vision of one company. As a publisher, do I want that? I honestly can't answer that question at this time. My next book is a year off--revision and formatting still in the future. I've got a while to read, discuss, and consider. 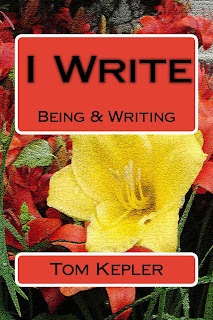 In the meantime, I Write: Being & Writing is available as a paper and eBook through CreateSpace/Amazon and Kindle. It should also soon be available through Smashwords. Take a look. I hope you enjoy and appreciate my (and CreateSpace's) end product.